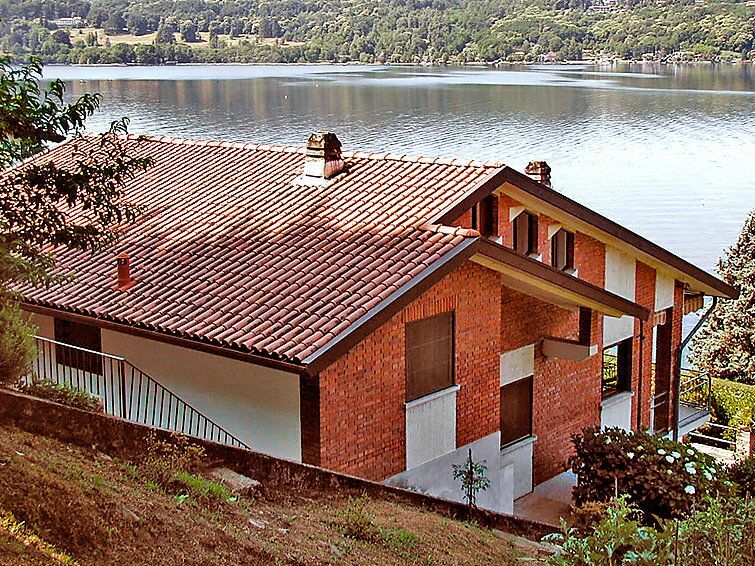 Corconio 3 km from Orta San Giulio: Single-family house "Villathis property", 3 storeys. In a sunny position on a slope, 30 m from the lake, road to cross, on a main road. Private: terraced garden (fenced) with flowers and trees. In the house: washing machine. Motor access to the house. Roofed, parking (for 2 cars). Shop 3 km, grocery 3 km, restaurant 1 km, bar 1 km. Nearby attractions: Omegna 12 km, Mottarone 8 km, Stresa 27 km. Well-known lakes can easily be reached: Lago Maggiore 15 km. Please note: car recommended. Road to cross to get into the privat garden (approx 60 m2). The garden is situated in front of the lake, it is shadowy by trees and closed by a gate. On the ground floor of the house, you have a big yard with 2 parking spaces.The responsible person looks after the garden two times per week. 5-room house 200 m2 on 3 levels on 1st floor. Practical furnishings: large living room with TV. Exit to the terrace. Kitchen-/living room (4 hot plates, oven, microwave, freezer). Exit to the terrace. Upper floor: 1 room with 2 beds. Exit to the balcony. 1 double bedroom. Shower/bidet/WC. 2nd upper floor: 2 small rooms, each room with 1 bed. Shower/bidet/WC. Large terrace roofed. Terrace furniture. Very beautiful view of the lake.